David and Janet Carle have been traveling the 38th Parallel, starting from their home at Mono Lake in the Eastern Sierra, seeking water-related environmental and cultural connections. 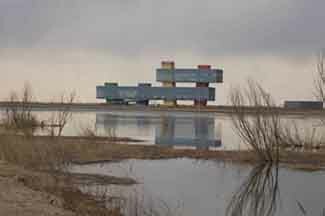 Their book The 38th Parallel: A Water Line Around the World will be published by UC Press in Fall 2012. So far, they have crossed the United States, Europe, Turkey, and Korea, and will finish the world exploration of the 38°North latitude by traveling to Japan, China, and Turkmenistan in 2011. Last year, they chronicled their journey here and on their blog. Now, we bring you a continuation of their story. Read their latest dispatch from China’s Yellow River Delta below. The Yellow River enters the Bohai Sea just south of the 38th Parallel (at 37 45’N; 119 10’E), but just a few years ago it occupied a channel right on the latitude line. 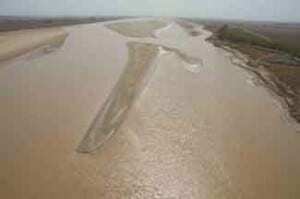 Because it carries so much silt—which turns it a yellow-brown color that explains its name—channels gradually fill with sand and the river has repeatedly jumped into new channels across this whole region. 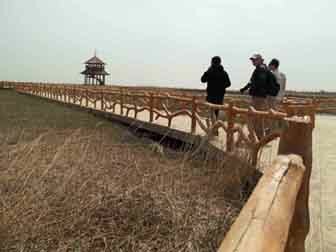 The Yellow River Delta National Nature Reserve has China’s newest wetlands, built since the last major shift in 1996. Driving from the city of Dong Ying, out to the delta, it was hard to believe a protected wetlands would be at the end of the road. Construction zones gave way to farms, then to oilfields, and finally to the wetlands at the mouth of China’s “Mother River.” Our first bird sighting was a massive Oriental White Stork, lifting off in a flash of black and white. Common Terns raced by in the high wind as we walked down beautifully designed boardwalks with intricate rails to birdwatching towers. Our guide from the Reserve was engineer Shen Kai, a supercharged bird expert with a huge telephoto lens on his camera. We zoomed to spots in the wetlands in our rental car, trying to keep his car in sight (our driver is our Chinese guide and interpreter, Kinder.) The Reserve was created in 1992 to enhance and protect the wetlands for migratory and nesting birds. At the edge of a huge oilfield, the managers struggle to keep enough “eco-diversions” from the main river to optimize water levels in the marsh. Surprises abounded. The strength of a howling wind that, thankfully, abated after lunch. The Reserve staff treated us to a mid-day banquet in a nearby village restaurant, and yet another banquet that night. A modernistic 2-story visitor center, built in 2010, looms over the landscape. From its roof (6 stories high) we had jaw-dropping views of the marsh and the Yellow River heading toward the ocean, just a quarter mile away. So far there are no services inside; they seem to have spent all their money on the incredible building, but it looks large enough to handle thousands of visitors. On less windy days, two boats are available for touring the river out to the sea. 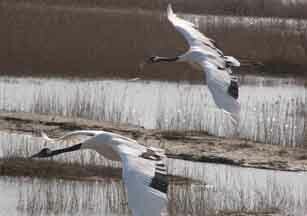 We are here at the end of the breeding season for cranes and saw red-crowned cranes in flight. The Reserve draws in more than 280 birds species and is one of China’s largest natural reserves. At dinner, we asked Shen Kai and Deputy Director Li Juanzhang what they would most like the people of the world to know about their Reserve. They commented on how difficult water management is (we will be exploring some of the human thirsts for water along the upper Yellow River in the next 2 weeks), but agreed that is was a worthwhile, satisfying goal to serve the birds. Called the “River of Sorrow” because of its history of flooding human habitations, the protection of the Yellow River Estuary, now alive with birds, is a hopeful sign that the Mother River will long enter the sea with the “birds of heaven” (cranes) winging above.